Can two of the people who helped make Chrono Trigger one of the most amazing games of all time find a balance on mobile between the nostalgic appeal of classic Japanese role-playing games and the economics of free-to-play? Based on a couple hours with Another Eden: The Cat Beyond Time and Space, the answer is: maybe. Once upon a time, I swore off mobile JRPGs. Feeling burned by their thread-bare plotting and microtransaction-driven progression systems, I decided games like Fire Emblem Heroes were not fun, colorful time wasters—they were just plain old wastes of time. Though Another Eden is cut from a similar mold, I decided to give it a chance because it was written and directed by Masato Kato, who penned most of Chrono Trigger’s script, and has music contributed by Yasunori Mitsuda, a composer who collaborated with Kato not just on that game but Xenogears and Chrono Cross as well. Another Eden’s opening hours do not measure up to any of those games, but compared to some other recent mobile JRPGs, like Star Ocean: Anamnesis, they’re much better. The music is prettier, there’s a greater degree of interactivity, and a sense that the story might lead somewhere vaguely fun. When the game starts, a mysterious baby boy named Aldo and a girl named Feine are discovered in a forest by a nearby village elder. Sixteen years later, the sister is kidnapped by someone calling himself the “King of the Beats” who is intent on using the girl’s latent magical powers to commit genocide against the human race. As Aldo, your goal is to get her back and thwart the King’s plans. It’s straightforward enough until a boss fight an hour in opens up a weird distortion in the fabric of time and space and you end up traveling 800 years into the future. That’s when things start to get very Chrono Trigger-y, complete with robots interrogating their humanity and questions about how history shapes the present. I’m still not sure whether Another Eden will shape up to be a good JRPG, rather than simply better in comparison to what else is available on mobile, but it’s off to a good start. I’m also happy to report that Another Eden also lets you navigate the world and fight monsters in turn-based combat just like you would in any other traditional JRPG. You can run through towns filled with shops and other characters, and explore dungeons with multiple paths. These might seem like small things but for the fact that lots of other free-to-play mobile RPGs don’t have them. While the combat is certainly streamlined compared to the console games that inspired it, every character has a class and set of special abilities that make choosing attacks and selecting targets for them something worth putting some thought into. I actually button-mashed less in my first few hours with Another Eden than in Dragon Quest XI, especially once I filled my party up with characters. 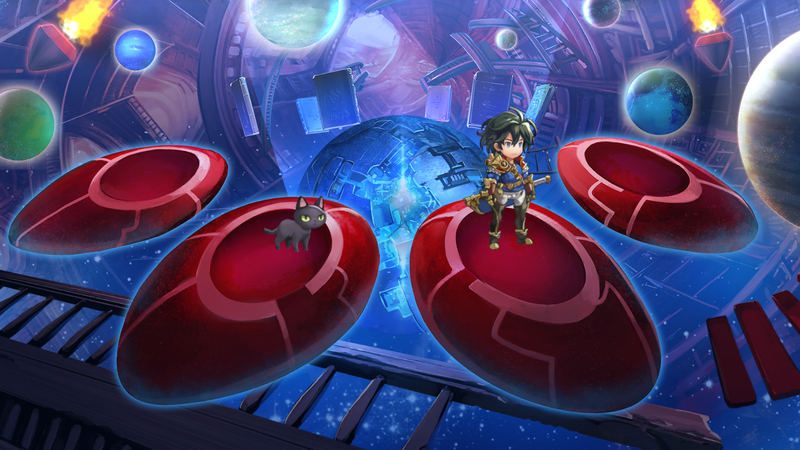 Partly a gacha-style game, Another Eden lets you buy new fighters with Chronos Stones, a currency that you can either pay a bunch of money for or earn from completing in-game challenges like killing a certain number of enemy type X or progressing in the main story. These transactions take place in a dimension called the Dream Gallery, which you can access at any time except during combat. Within the first hour, I had enough stones to buy my first character. I haven’t yet found a fight that I can’t beat with my existing party simply by grinding, leveling up, and buying better gear. It’s possible I might at some point, but so far I feel completely content to just keep playing through the game without spending any money. Unlike some free-to-play games, the horse-race of collecting all of the game’s fighters, and the strongest versions of them, feels legitimately like a side activity and not the focus of the gameplay. So far in Another Eden, the story really does seem to be the focus. I’m relieved for now, but we’ll see how long this lasts.